On Friday, October 21, Journalism teacher Leslie Chausse’s D period journalism class took a field trip to Southern Connecticut State University to attend Journalism Day. This event brought students together from other schools, such as North Haven and Ansonia, as well as many others. 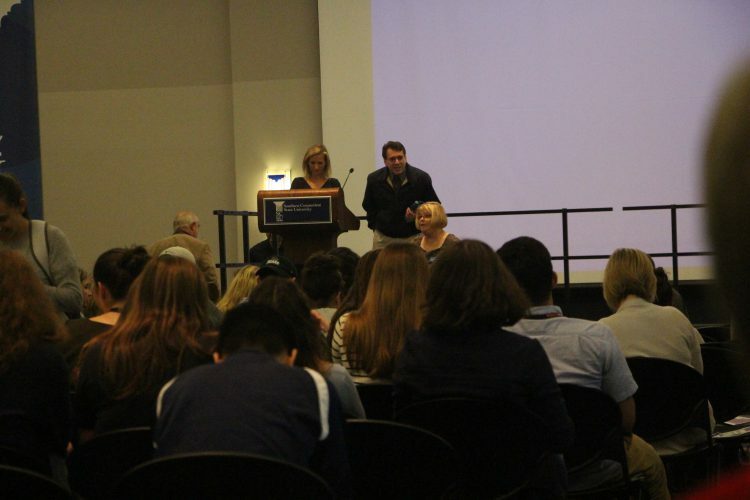 At the event, students were able to choose between two 50 minute workshops about journalism. We had the option to participate in several different workshops including radio broadcasting, photojournalism, social media, sports media, using quotes, tips and tricks for writing articles, pics, choosing topics, using sources, interviewing, and journalism setting. We also watched a drone demonstration that fascinated everyone in the room. After this, we proceeded to our first workshop. This article will highlight the workshops that I went to, which were “140 Characters in the Courtroom” and “The World of Sports”. Our day began with a run through a downpour from our bus to the entrance of the student center. After drying off, we were offered cookies and refreshments and were directed into a presentation room where we were informed of the day that was ahead of us. The first workshop that I attended was “140 Characters in the Courtroom”, which was directed by Professor and Hartford Courant journalist Alaine Griffin. She explained that journalists will use Twitter, and used a personal experience as an example. Her first case that brought her to Twitter was the trial of the Cheshire home Invasion. The two men broke who broke into a house and killed the Petit family were on trial. Griffin said that journalists will use Twitter as it is easy to get information out, but it must be accurate and credible. Griffin explained that 140 characters is a hard limit when describing something important. Griffin recommends that anyone interested in becoming a journalist should major in English and journalism as they are a good combo. Overall, this workshop showed how journalism and technology go hand in hand. The second workshop that I attended was “The World of Sports” which was directed by professor and sports reporter Dominic Amore. There were many different topics discussed in the workshop, which included steroid scandals and baseball retirees. The focus quickly shifted to the world of sports. Amore claimed “We don’t jump to conclusions,” and went on to explain that “you have to know [what you’re reporting, and] you can’t throw a topic out.” Sports reporters, will write “hot takes”, which are common when a journalist writes something based on the opinions of what people are upset about in a particular sporting event. The topic then shifted to how a reporter needs to think through what he or she wants to write about to make sure that the piece you plan to write will not look bad and come back to haunt you in the future. If you did not already know, The Morgan PawPrint has its very own sports page. Click here to view it. The day concluded with a guest, Jenn Bernstein from Fox 61. 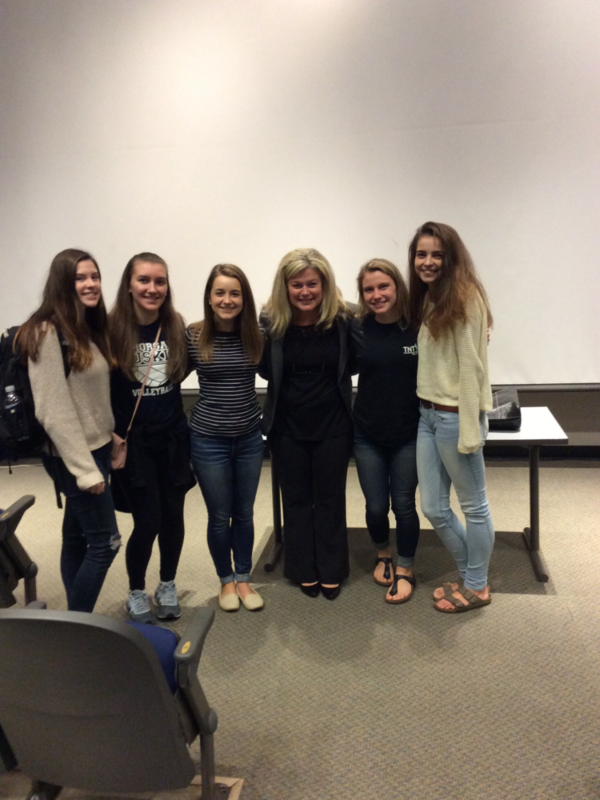 However, due to our Pep Rally schedule on Friday, our group was not able to stay to hear her speak. Overall, Journalism Day was a very positive experience for everyone that attended. Being a first-time journalist for the Morgan PawPrint, I feel that I learned different aspects of the journalism field by attending. Hopefully by next year, more students will join journalism and have the honor of attending, therefore enhancing their knowledge of journalism.